At this point we have been made aware Eric is still under the custody of Englewood even though he is in Florence. It is them bringing these charges and them investigating this week leading up to his hearing on Friday. harm to his children. This is a very serious issue. URGENT!!! PLEASE CALL IN FOR ERIC KING! We expect Eric to face a disciplinary hearing this Friday (January 27th) for a write-up filed against him in retaliation for him attempting to hold a guard accountable for their actions in the visiting room. Call in to the Inspector General and Bureau of Prisons (BOP) to demand that they investigate this in order to dismiss the disciplinary charges without upping his points; let them know we will not let this go on without a fight. On December 19th at FCI Englewood during Eric’s visit, Officer Eglington followed Eric into the bathroom and began to harass him while Eric was attempting to use the restroom. 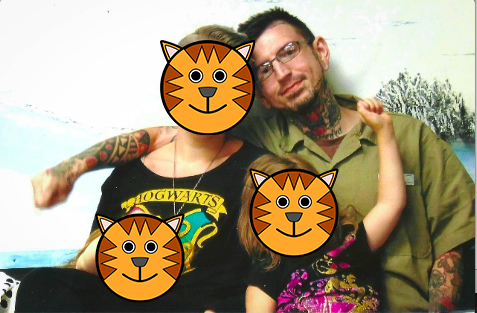 When Eric did not respond, Eglington stated that he was going to ruin every visit Eric has and that he was going to have his boys assault Eric’s children. Eric and his partner immediately called the Lieutenant on duty and Officer Eglington was removed from his post that night; the officer was also given a warning for his behavior. During the next visit on December 23rd, Officer Eglington was assigned the same post in the visiting room and the children were forced to interact with him. Because of this, Eric filed all of the internal forms (BP9) required by the facility to request that Eglington get removed from visitation duty so that the children did not have to endure these emotionally stressful interactions and then feel unsafe during their visits. Eric’s partner also filed a report with the inspector general. The facility let Eric know that he would have an answer on Friday January 6th regarding his complaints. However, on January 6th, Eric’s partner went to visit him only to be told that he was relocated to Florence awaiting disciplinary charges. The disciplinary charges could further limit visitation/phone calls/access to commissary (which as a vegan is extremely crucial because the BOP only guarantees one fully vegan meal a day). The disciplinary charges will also increase his point level and even possibly relocate him to a disciplinary yard or a prison with much higher security. This would further isolate him from his family, friends, and supporters for the rest of his prison sentence. It is very clear that these disciplinary charges are retaliation for the incidents that occurred in the visiting room. We CANNOT let them do this to our friend and comrade. We believe that the hearing will be this Friday, January 27,, which means we only have a few days to help our dear friend. Please call the office of the inspector general and the BOP’s oversight and review division to let them know that these disciplinary charges are retaliation from his attempt to hold a guard accountable after threatening two children. Ask the Inspector General to investigate the complaint. Below is a script to follow as well as the contact information for the Inspector General and BOP. Hi I am calling regarding Eric King, who is a prisoner at FCI Florence. His inmate number is 27090045. On Dec 19th a guard at FCI Englewood threatened Eric’s children and internal complaints were filed about the guard’s behavior. When those complaints went unanswered, a complaint with the Inspector General was filed on Jan 3rd and then again on Jan 12th after Eric was brought up on retaliatory charges. So that Eric is not punished for pursuing the proper channels to ensure his and his visitors’ safety, we ask that you please investigate the situation in order to dismiss these disciplinary charges without upping his points and respond to these complaints. Thank you so much for responding to this call to action! No numbers worked. Last place only takes complaints in writing snail mail or on website (they won’t give email) http://www.oig.justice.gov. First number is audit number. No help. BOP Sarah not in staff directory, when pushed button for choice 1 it said transferring to Steve someone and went dead. Quick tip: looks like you can also email the Denver Field Office through the form on this page: https://oig.justice.gov/about/contact.htm Good luck! Estamos a la espera que Eric se enfrente a una audiencia disciplinaria este viernes (27 de enero) por un escrito presentado contra él en represalia por la acusación de Eric contra un guardia haciendole responsable de sus acciones en la sala de visitas. Llamar al Inspector General y a la Agencia Federal de Prisiones (BOP) para exigir que investiguen esto para descartar los cargos disciplinarios sin aumentar sus puntos; Hágales saber que no dejaremos que esto continúe sin una pelea. El 19 de diciembre en FCI Englewood durante la visita de Eric, el oficial Eglington siguió al compañero al baño y comenzó a acosarlo mientras que este intentaba utilizar el lavabo. Como él no respondió, Eglington le dijo que iba a arruinar cada visita y que iba a hacer que sus hijos asaltaran a los hijos de King. Eric y su compañera inmediatamente llamaron al teniente en servicio, con lo cual el oficial Eglington fue removido de su puesto esa noche, además de recibir una advertencia por su comportamiento. Sin embargo, el 6 de enero, la compañera de Eric fue a visitarlo sólo para que le dijeran que fue trasladado a Florencia a la espera de cargos disciplinarios. Los cargos disciplinarios podrían limitar las visitas / llamadas telefónicas / acceso a la tienda de comidas (que como vegano es extremadamente crucial porque la BOP sólo garantiza una comida completamente vegana al día). Los cargos disciplinarios también aumentarán su nivel de punto e incluso posiblemente lo trasladarán a un patio disciplinario o a una prisión con mucha mayor seguridad. Esto lo aislaría aún más de su familia, amigos y compañeros por el resto de su condena de prisión. Es muy claro que estos cargos disciplinarios son en represalia por los incidentes ocurridos en la sala de visitas. No podemos dejar que hagan esto a nuestro amigo y compañero. Creemos que la audiencia será este viernes, 27 de enero, lo que significa que sólo tenemos unos días para ayudar a nuestro querido amigo. Por favor llame a la oficina del inspector general y a la división de supervisión y revisión de la BOP para hacerles saber que estos cargos disciplinarios son en represalias en un intento de mantener a un guardia responsable de amenazar a dos niños. Pídale al Inspector General que investigue la queja. A continuación se muestra un guión a seguir, así como la información de contacto de el Inspector General y la BOP. Hola estoy llamando con respecto a Eric King, que es un prisionero en FCI Florencia. Su número de recluso es 27090045. El 19 de diciembre un guardia en FCI Englewood amenazó a los hijos de Eric y se presentaron quejas internas sobre el comportamiento del guardia. Cuando esas quejas se quedaron sin respuesta, una queja con el Inspector General fue presentada el 3 de enero y luego otra vez el 12 de enero después de que Eric fue trasladado con cargos en represalia. Para que Eric no sea castigado por seguir los canales adecuados para asegurar la seguridad de él y de sus visitantes, le pedimos que investigue la situación para descartar estos cargos disciplinarios sin aumentar sus puntos y responder a estas quejas. Muchas gracias por responder a este llamado de acción!